Remember your outdoor Ed forms Grade 8 as well as the $25!! You also need to start planning what warm outdoor clothes you plan on wearing on the trip. Organize this in advance so there is less last minute panic. Ever complain about going to school? Ever feel like you just don't feel like going because there are other things you would rather do? Today's lesson will explore the power of knowledge and how an education is essential in changing the lives of kids around the world. We're going to watch a video from the series, The New Heroes, "The Power of Knowledge"
Can't Wait for the Movie, Catching Fire?? Me too! So excited... My favourite is Sesame Street's "Peeta". Grade 8's do not rush this assignment. It is to be at least 3 paragraphs. However for a quality introduction and conclusion maybe 5 paragraphs. Read through the whole assignment sheet I gave you, or check out previous blog posts on this assignment. Be sure to REVIEW ALL THE QUESTIONS I gave you on the assignment. 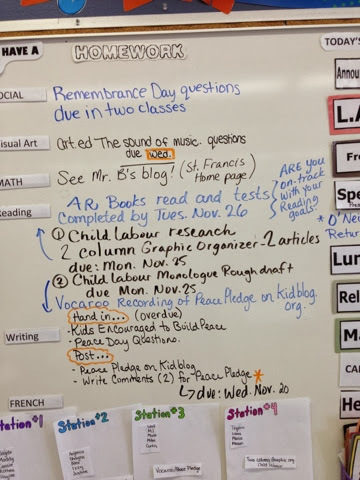 This means do not rush, as this is an assignment you need to research, get an informed opinion of what it's like to be a child labourer, then write from their perspective. You are going to be the voice of those kids who have no voice. What kids of things do you need to include? For example, You need to explore exactly what you eat, where you sleep... Go through ALL THE QUESTIONS from the assignment and ANSWER THEM IN THE MONOLOGUE. Be sure to fully explore the details of what it's like to be a child labourer. Paint your audience a picture of your life!! Get the audience to think and care! Paragraph #2 – How you ended up being a child labourer, how long have you been a labourer, what has life been like for you up to this point. Paragraph #4 – Your hopes, dreams for the future. What does your future look like with no education? THE PRESENTATION Finally, find a picture on line that you think could represent your child labourer. See Tag galaxy.com and type in “child labor” and “poverty”. Then choose a picture, save it in your pictures and upload to kidblog. EXTENSION... Consider adding more visuals to help your audience connect with your Monologue. 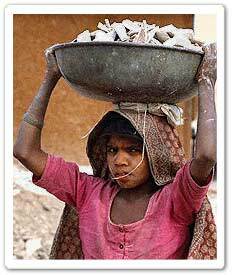 Remember the overall objective is to tell the story of a child labourer and get your audience to care about the issue. What can you add to your post to get your audience to care? ** YOU WILL HAND IN YOUR RESEARCH, the TWO COLUMN GRAPHIC ORGANIZER (be sure to cite your sources!!) I Will expect to see about 2 of these. We were fortunate to be invited to O'Neil's Health and Wellness Fair. This means students will see exhibits and presentations all related to issues that affect teens today. More opportunities to practice math in game format!! How are all these concepts connected? 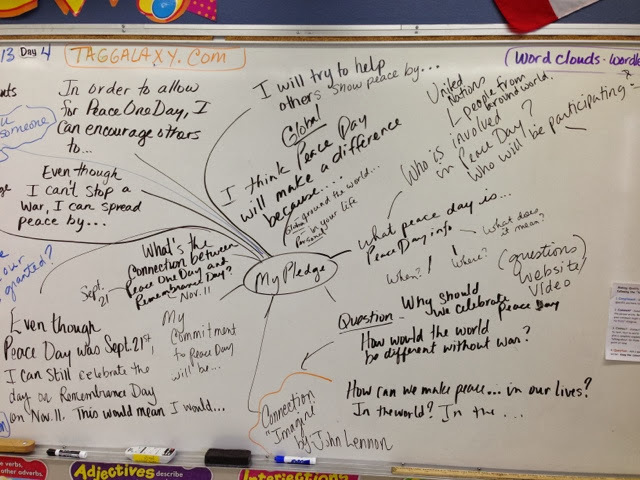 In the next couple days, you will share with your peers in an informal digital setting your thoughts and connections using a "digital wall" at padlet.com. Click on the link and go to our digital discussion board. 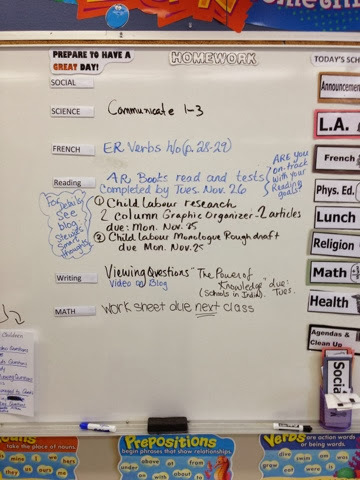 More information for using Padlet - see this video. For future discussions and collaboration, we are going to try another site... Edmodo. How do I write a great blog comment, so it's more than... "Cool. Your blog is great! Thanks for sharing." See this link, "Commenting Poster" for tips. 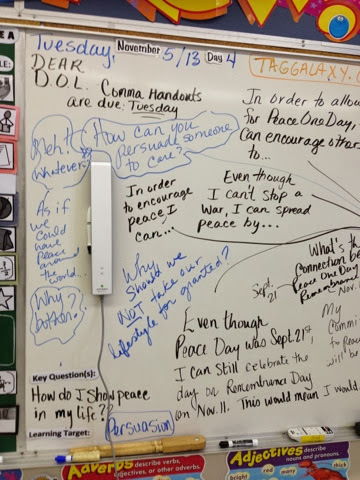 Be sure to complete all video questions for the peace one day assignment. 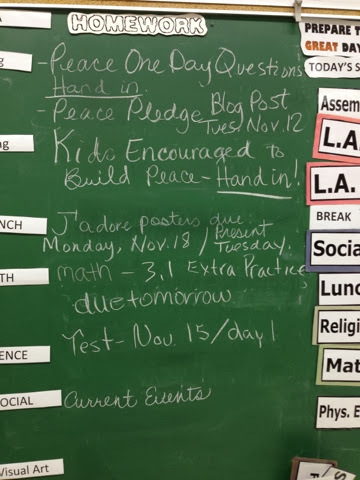 In addition to this, students are expected to have the brainstorm for their peace pledge completed and a start on their rough draft. French... In the next couple days we will be working hard on writing sentences with J'aime, J'aime beaucoup, and Je n'aime pas... This will be applied to posters all about students - likes and dislikes. Students will complete posters and present their information in a brief oral presentation. This will be completed in the next two weeks. Here are some tips for getting ready to record your Pledges for Peace via vocaroo. Essentially you are preparing a podcast to embed in your kidblog. (we will discuss further in class). While you may be the one speaking, speaking isn't really about you. It is about your audience. The 4 Cs will help you get in the mindset to give a great presentation or a podcast. Consideration - Who is my audience and what is important to them? Confidence - What confidence tips will help me give a good performance? Contribution - How will my "mini-speech" help to inspire others? Projection – Make sure you are easily heard, but not so loud that your audience is blasted by your voice when it's recorded. Choose something that you are interested in. Who will be listening to your podcast? What is the aim of your podcast? - to persuade, inform, entertain, etc. Brainstorm ideas, jot- note them down. Note personal stories you can add to make it more interesting. Should you research? This means not just internet, newspapers, magazines, library, family friends etc. How can you make your podcast all the more meaningful?? Here is the simple rubric that will be used to assessed your PEACE PLEDGE. 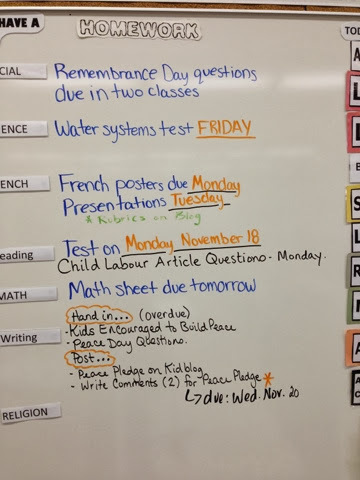 Remember there's no school Friday, November 1st, as it's the Teacher Retreat Day.